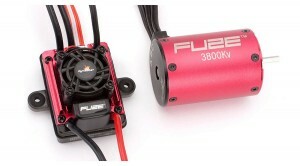 Horizon Hobby introduce the Dynamite Fuze 1/10 4-pole brushless motor and speed controller combos. They include a splash waterproof Fuze 70A speedo that comes pre-wired with EC3 battery and bullet-type motor connectors while an add-on heatsink lowers the ESC’s temperatures when the going gets tough. The sensorless controller can handle up to 3S LiPo batteries and its case sports mounting lugs for a secure fastening on the chassis or radio tray. The included sensorless 4-pole motor is available as 3800kv SCT or speedier 4800kv variant for general use and both sport an updated rotor and stator design for increased performance and efficiency. Coming in a red aluminium can the motors feature ball bearings and a closed can design making them ideal for off-road applications.